The 3-masted schooner JOHN B. MERRILL was one of the finest sailing vessels of her time period on the Great Lakes. She was built in Milwaukee in 1873 by Allen, McClelland & Co., and named for a prominent Milwaukee businessman. Her dimensions were: length, 189 feet; beam, 34 feet; hull depth, 13.3 feet; and gross tonnage, 640 tons. The assessed value of the vessel when new was $57,000. The Detroit Free Press of September 9, 1873 said, “The new three-and-aft schooner JOHN B. MERRILL passed down bound September 5th on her first trip. Her capacity is estimated at 40,000 bushels. The ship was launched at Milwaukee. The JOHN B. MERRILL enjoyed a prosperous 20-year career on the Great Lakes hauling mostly coal, grain, or other bulk cargos. She was known for her large cargo capacity and for her fast sailing. In July of 1886, she defeated the schooners MOONLIGHT and MARENGO in a race from Buffalo to Milwaukee. On November 1, 1883, the Merrill went ashore at Cleveland while trying to enter the harbor in rough weather. Her crew of nine men and one woman were rescued by the U. S. Life Saving Service. 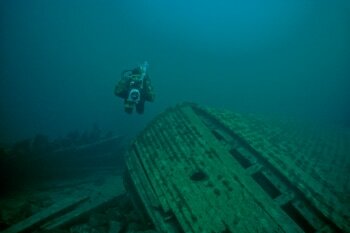 In April of 1892, she was sunk in a collision with the Steamer FRED MERCUR at Bar Point (at the mouth of the Detroit River). After these two accidents, the JOHN B. MERRILL was promptly raised and put back into service, but her luck was about to run out. On October 14, 1893, the Merrill went aground on Holdridge Shoal, south of Drummond Island, broke up and slid into deeper water where she remains to this day. In the early part of October 1893, the JOHN B. MERRILL left Buffalo with a load of hard coal, bound for Marquette, MI in tow of the Steamer F. E. SPINNER, along with an unnamed schooner barge. Her Master, Captain Hawley M. Boyce in a later interview stated that as they were departing Buffalo, a black cat that had been adopted by his wife jumped ship, making a ten-foot leap to the dock just as they were pulling away. This was certainly a sign of bad luck; and, in fact, bad luck was soon to come. Somewhere on northern Lake Huron, the F. E. SPINNER and her two consorts encountered a severe gale. As they were approaching the safety of DeTour Passage, the towlines parted. Captain Boyce decided to steer the Merrill down wind, heading east in hopes of finding shelter in False DeTour Passage. Before they could reach False DeTour, the vessel went aground on an uncharted shoal (later to be named Holdridge Shoal). There was no loss of life in this incident; the crew of 9 was rescued by fishermen from DeTour. The JOHN B. MERRILL and her cargo of coal was a total loss. 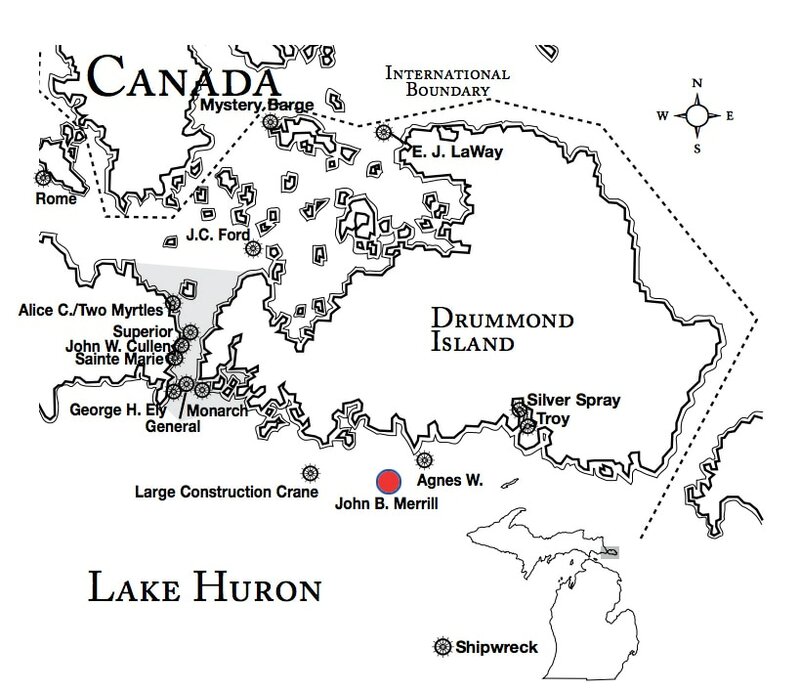 Wreck Description: The JOHN B. MERRILL is a most magnificent wreck and is the “flagship” wreck of the Drummond Island/DeTour Passage area. It lies in depths of between 35 and 85 feet of water. One of the wreck’s enormous anchors lies in 35 feet of water near the top of Holdridge Shoal. 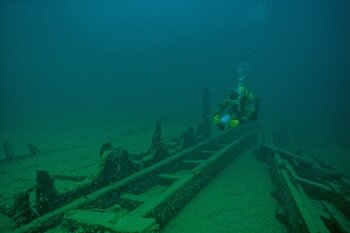 The anchor chain leads to the main wreckage which begins in 60-65 feet of water. The large debris field covers an area of approximately 200 feet square.